One of the activities we did today was a math activity. 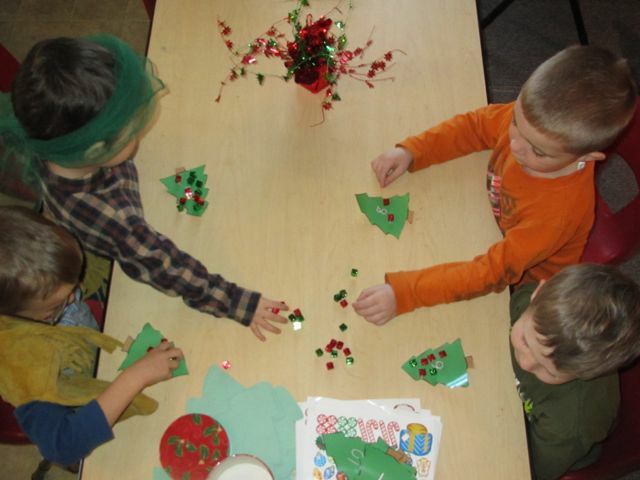 The kids each had trees with numbers on them and they would identify the numbers on the tree and then place that many presents under the tree. Many of our friends are still struggling with recognizing numerals. Sorting objects by shape, color, and size. Counting to ten. Recognizing groups and patterns. You can help your preschooler master these early math skills simply by playing games in and around the house. Forget the flashcards and number drills; if you want your child to love numbers, show him how math is part of everyday life and he’ll be eager to learn more once he starts school. Here are 12 fun ways to introduce your child to the world of math. 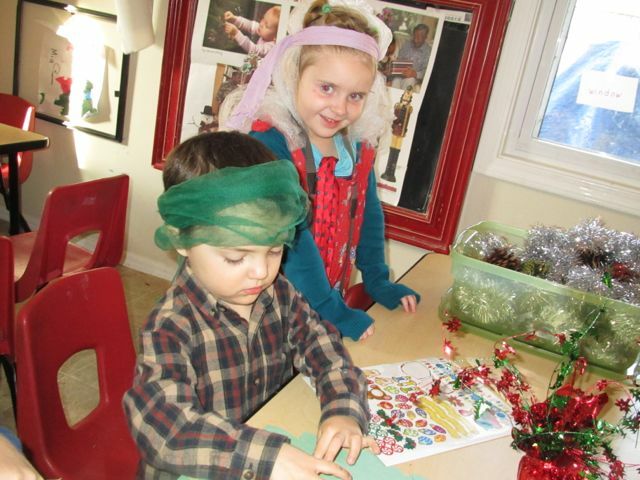 Because children learn in different ways, they’re arranged by learning style. Go on a number safari. When you’re driving around town, have your child look for numbers in street and store signs, and on license plates. Call out the numbers as you find them. Your child should be able to recognize numbers up to ten before kindergarten. Connect the dots. This old standby will help your child understand number sequencing; that is, that one is followed by two, two by three, etc. Bookstores are full of coloring books with connect the dot themes (and don’t worry if your child only wants a Teletubby or Pokémon theme — it’s all about the numbers right now). Make a phone call.Write the phone number of a friend or relative down on a piece of paper. Have your child dial the number to give him practice reading numbers left to right. Count everything around you. Count people standing in line, the number of steps to the library, the cracks in the sidewalk. Count and sort household items. Mix up the knives, forks, and spoons from the silverware drawer and have your child group them by type and count how many there are in each group. Do the same with your sock drawer (by color, by size), your child’s stuffed animal collection (group the animals by big and small; put all the bears together). Have your child help you fold and sort laundry. How many socks are there? How many T-shirts? Have him divide them into groups. Go on a shape search around the house. Look for squares, triangles, circles, stars — any kind of shape. Your child will be expected to recognize, draw, and manipulate shapes well into 1st grade (not to mention high school geometry!). Play with shape puzzles and blocks. Manipulating three-dimensional objects — playing with a shape-sorter box, for example — will introduce your child to basic geometry as well as help develop his fine motor skills and spatial reasoning. Make a counting book. 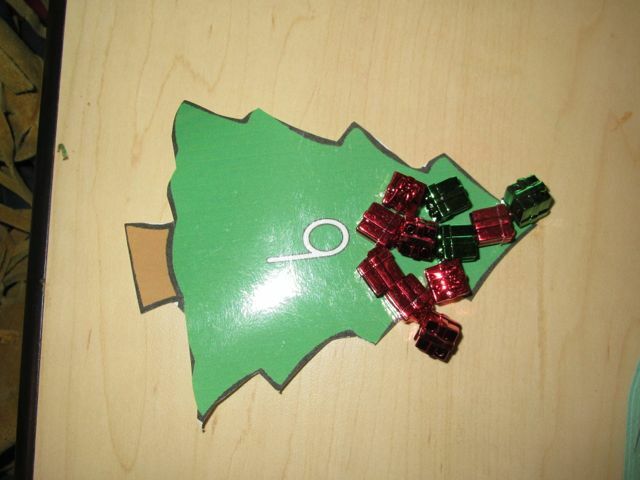 This activity has a reading and a math component: With some help from you, have your child go through an old catalog or magazine and cut out all the items that start with the letter “A” and paste them onto a piece of construction paper. When you’ve gone through the list, count all the pictures on each page. Make a game out of snack time. For example, give your child a handful of goldfish crackers, and draw a picture of a fishbowl on a piece of white paper. Put the fish in the fishbowl and have your child count them. Take one out, and count again. Play pattern games. For example, give your child green and purple grapes. Have him arrange them in different patterns: purple, green, purple, green. Or green, green, purple, green, green. Look for patterns in nature: rings on a caterpillar, the whorl on a snail shell, or things that come in pairs such as eyes, ears, or two peanuts in a shell. This activity will develop your child’s problem-solving skills and his ability to think abstractly. Listen to counting rhymes and songs. “Three little monkeys jumping on the bed; one fell off and bumped his head. Mama called the doctor and the doctor said, ‘No more monkeys jumping on the bed!’ Two little monkeys jumping on the bed…” Any variation on this counting rhyme introduces basic subtraction. Look for children’s games and music activity tapes such as the Wee Sing series that features songs about numbers. Make a recipe with your child. Give your child the measuring cups and bowls and let him measure out the ingredients while you read the directions out loud. An easy — and delicious — way to introduce concepts such as volume and weight. 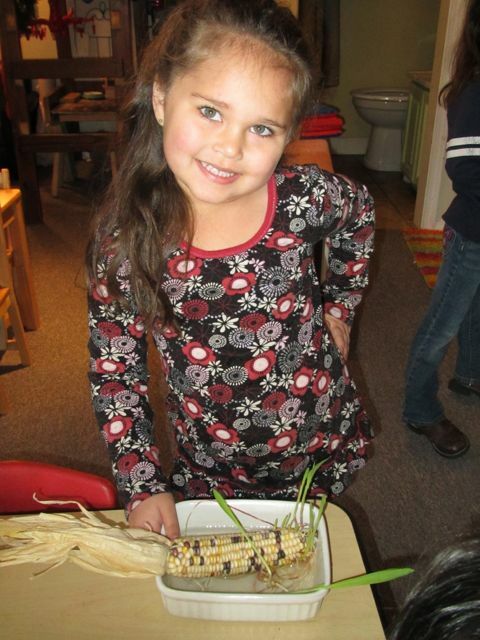 Remember when we put the Indian corn in the bowl of water to see what would happen ? You never know what ” get up” my friends will have on at any given point in the day. 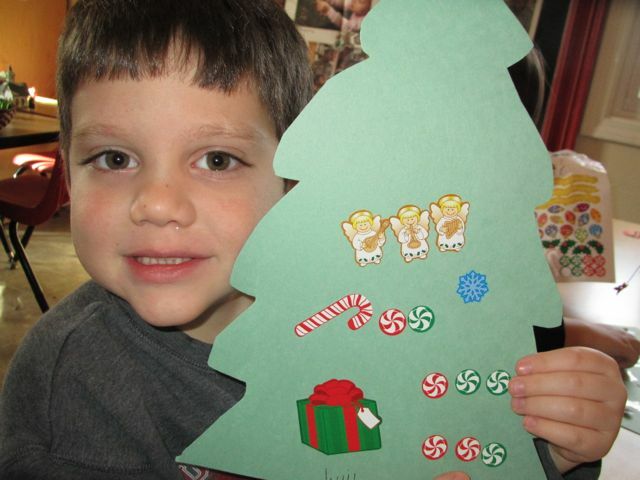 Another fun thing we did today was decorate a cut out tree with stickers. We are getting our fingers ready to write ! As William put his stickers on he said look Ms Debbie , I have an angel band ! It was another good day. I got home at 9:45 tonight but had a wonderful time at the North West Arkansas Early Childhood Association Christmas Party / meeting. I am always always overwhelmed at the shared passion so many of my professional friends have for children. It makes me want to be a better provider.